Improved Construction, Financial & Operational Reporting! We have pre-built financial and construction dashboards, drill through reports and analytics that connect to your accounting system. Save time and align your organization to best practice KPI’s. Anterra provides enterprise quality financial and construction reporting to you at a fraction of the cost. We deliver world class reporting across your organization. anterraBI™ contains drill through financial statements, dashboards, scorecards and analytic tools to quickly see where you are performing outside of your plan. Easy to use. anterraBI’s interface is built by people with extensive Construction experience along with feedback from industry leading companies. Anterra lets you design and build your own dashboards plus you can build your own key performance indicators that drill down to transactions. Click on the image below to launch an overview video. Watch your margin trend by job over time. 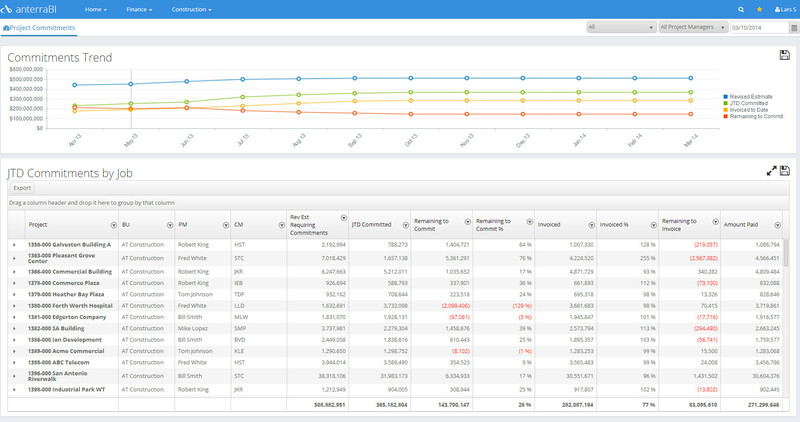 Our margin analysis dashboards and scorecard enable you to be proactive. You can quickly pinpoint what jobs and what particular costs are causing you to lose margin and take corrective action. Avoid the unpleasant surprise of disappearing margins at the end of jobs. If your expected margin is disappearing at the end of your jobs you need this report. You can manage your job forecasts in Anterra. No more Excel job by by spreadsheets. Project Managers can enter Forecast at Complete or Forecast to Complete entries in as much detail as they like. Their entries immediately populate your Work in Progress Report. Anterra has made job forecasting easy and lets you drill down to forecast transactions. Click on the screen shot below to launch a video to show you how you can improve your forecasting process. See your work backlog trend over time and drill to work backlog by division and project manager to see how your current backlog is spread across your company. Anterra provides you with an instant picture of work backlog over time. You can drill into the graph and see your allocation of work by division and project manager so you can see your resource allocation. We provide a clear picture of the health of your business. Instant status of costs to date and variances with drill down to transactions. We optionally red flag jobs and cost codes where costs have been recorded against items without an estimate. This is an early warning indicator that you have a miscoding or need to do an estimate change order. Want to know where you make or lose money on jobs? Our pivot grid works with your company’s set up to let you “slice and dice” your job margin to find out where you are most and least profitable. Knowledge is power and this helps you assess your bidding and work allocation strategy. Tired of preparing your WIP in Excel? We’ve helped many large client automate their WIP process. We have drill through cash trend graphs to eliminate daily cash reporting spreadsheets and let you see your balances over time. Click here to go to our customer success story page or click here to go to our real estate BI home page. We have worked with construction companies around the world to develop reporting with built in best practices. We’ve developed a data cube that lets us do trend analysis so you know where you are heading. We have trend graphs for financial ratios, net income budget vs. actual by company, work backlog and job margin gain/erosion. To find out for yourself, call us at (832) 539 1400 and press 1 for information or fill out our contact us form form for more information. How much does anterraBI™ cost? anterraBI™ is priced on a named user basis. There are 3 components to a quotation: a) an annual hosting fee per named user with volume discounts b) an annual data transfer / storage fee and c) an implementation fee based on deployment of our standard reports plus customizations you would like. We will be happy to prepare a quotation after we understand the number of users and implementation requirements. Are licenses concurrent or named user? anterraBI™ licenses are issued per named user as the underlying platform is Microsoft. This allows user and group based security. Can reports be customized in anterraBI™?? Yes, our reports can be customized per client or we can create reports based on client designs. Our technology includes an OLAP data cube so we can build virtually any report desired. My data isn’t very clean. How will anterraBI™ work if the data isn’t clean? Every client of every size has data quality and governance issues. We find that most issues are simple to clean up with a few hours work. For example the name of a project manager may be TSmith on one project and Tony Smith on another. During the implementation we provide reports to assist in data clean up. Once our BI reports are in use the data processes settle in quickly to keep data clean. For example gross margin or profit erosion reports by project manager will quickly show multiple spellings of project manager names. How long is a typical implementation? We implement Financial, Construction and Real Estate BI in the priority of each client. Each implementation is typically a few days of consulting time per module with a few hours of the client’s time required.